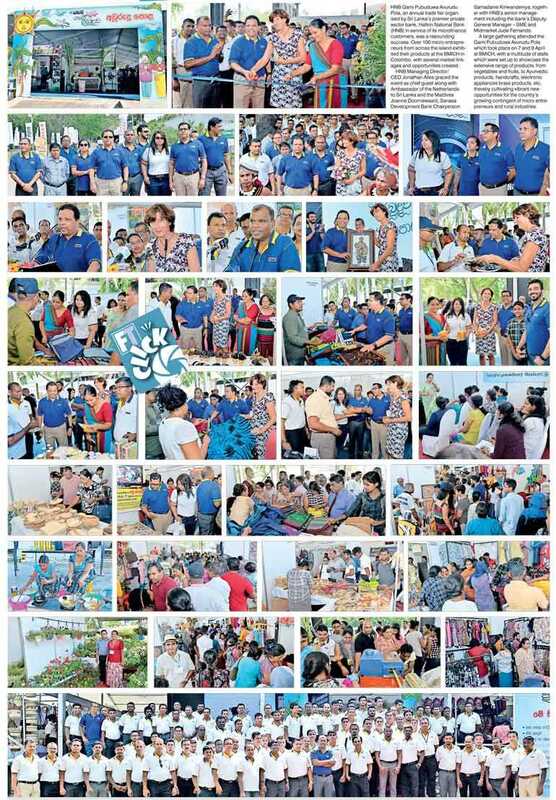 HNB Gami Pubuduwa Avurudu Pola, an annual trade fair organised by Sri Lanka’s premier private sector bank, Hatton National Bank (HNB) in service of its microfinance customers, was a resounding success. Over 100 micro entrepreneurs from across the island exhibited their products at the BMICH in Colombo, with several market linkages and opportunities created. HNB Managing Director/CEO Jonathan Alles graced the event as chief guest along with Ambassador of the Netherlands to Sri Lanka and the Maldives Joanne Doornewaard, Sanasa Development Bank Chairperson Samadanie Kiriwandeniya, together with HNB’s senior management including the bank’s Deputy General Manager – SME and Midmarket Jude Fernando. A large gathering attended the Gami Pubuduwa Avurudu Pola which took place on 7 and 8 April at BMICH, with a multitude of stalls which were set up to showcase the extensive range of products, from vegetables and fruits, to Ayurvedic products, handcrafts, electronic appliances brass products, etc, thereby cultivating vibrant new opportunities for the country’s growing contingent of micro entrepreneurs and rural industries.